Adopting a gold standard will shut down the printing presses and not allow the financial elite to manipulate the money supply and perpetuate the fractional reserve scam which is a monumental form of embezzlement and thievery. It turns out the ISIS scam driving the war machine of the state may also serve the propaganda purposes of the financial elite and the central bankers. The terrorists, beheaders and crucifiers are adopting a gold standard. 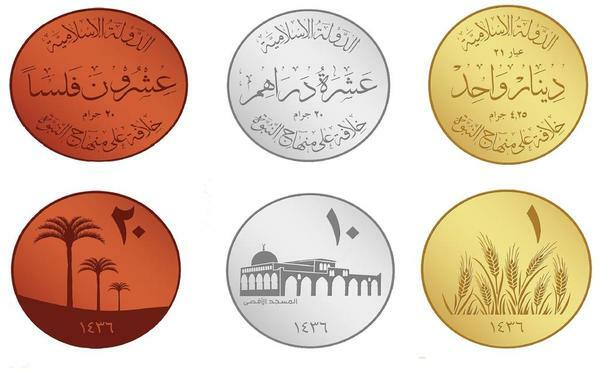 While ISIS has yet to confirm the introduction of its currency, social media is awash with claims that leading religious figures announced the plans during recent prayers in Mosul and Nineveh province.